Royal Flush Hunting Lodge – a premier Aberdeen, SD Hunting Lodge features a wide array of opportunities for those who are visiting South Dakota for the first time. There are plenty of things to do at the lodge when the hunt is over and the night has begun. There are different options depending on your desires. Either enjoy the game-room or relax in the lounge area. 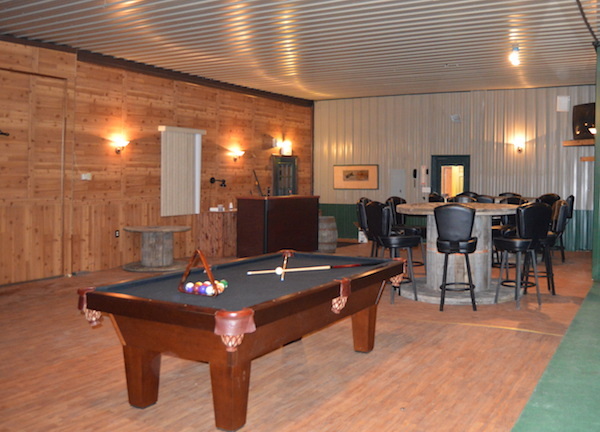 In the game-room, hunters can challenge their buddies at some pool, darts, or ping pong that is included for free. There are always plenty of decks of cards around if anybody wants to play games from Pinochle to Poker. All of this can be done while watching DirectTv, Sunday Ticket, or listening to some music. If a little more peace and quiet is on your to-do-list, enjoy some relaxation in the lounge area with the fireplace glowing while watching some t.v. Free wifi is also available. We have 10 rooms available along with 3 community bathrooms/showers. If you prefer to have a room with a private bathroom, we do have a limited amount of those. Some of the rooms also have a private entrance to the dog run area.